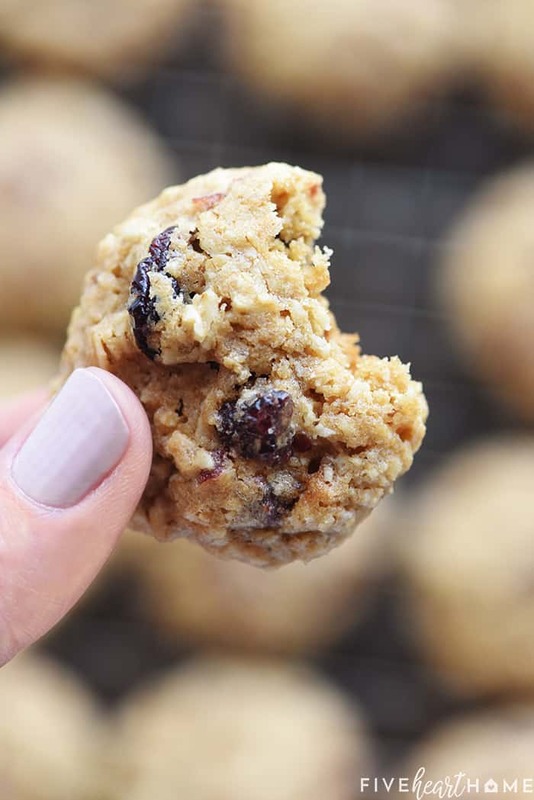 Oatmeal Lunchbox Cookies are small, wholesome, healthy cookies for kids that are perfect for tucking into a lunchbox to brighten your favorite child’s day! I don’t know about you, but we’re only two weeks into the school year and I’m already tired of packing lunches. Ha! But not really.? I happily whip up breakfast for my family every morning, and half the time, I actually enjoy cooking dinner. And when the kids are at home in the middle of the day, I don’t mind making lunch at all. But assembling sandwiches and slicing apples to stuff inside a lunchbox? For some reason, it’s just not my jam. That being said, I try to be cognizant of the fact that my kids would probably appreciate a little variety in their school lunches. So I rotate my ol’ stand-bys so that they’re not eating the same exact thing, day in and day out. And I always try to slip in a small special treat to let them know that I love them and I’m thinking of them while they’re at school. For my younger two, that could mean a little note in their lunchboxes. But my newly minted middle schooler requested that I stop putting notes in his lunchbox a couple years back(?). So for him, the “I-love-you” has to be slightly more subtle. And nothing says I love you like a little shot of sugar, am I right? 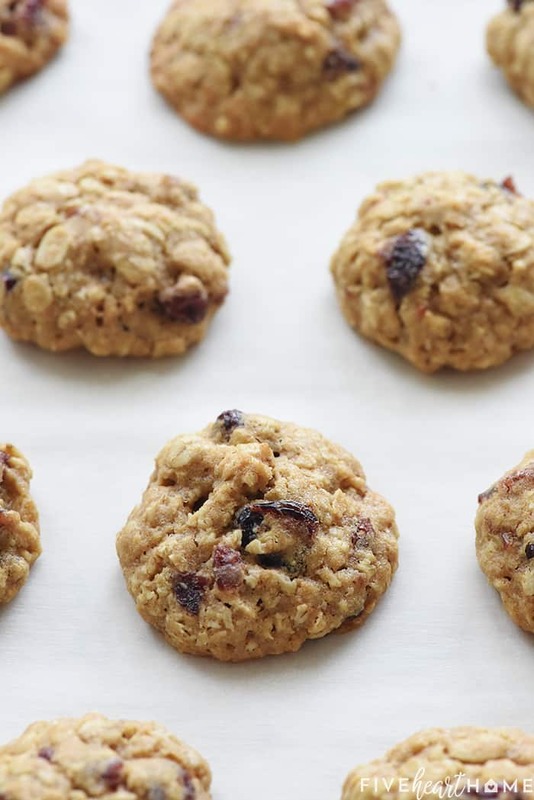 These Oatmeal Lunchbox Cookies do contain sugar, ’tis true. 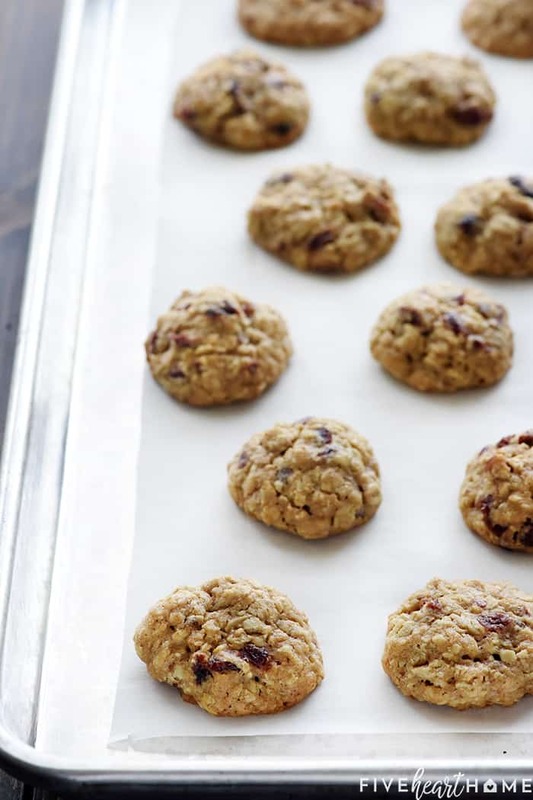 But they also include wholesome ingredients like rolled oats and whole wheat flour. So perhaps they’re not healthy, but I would definitely consider them healthy-ish. Especially compared to the Oreos that I could be sticking in my kids’ lunchboxes. 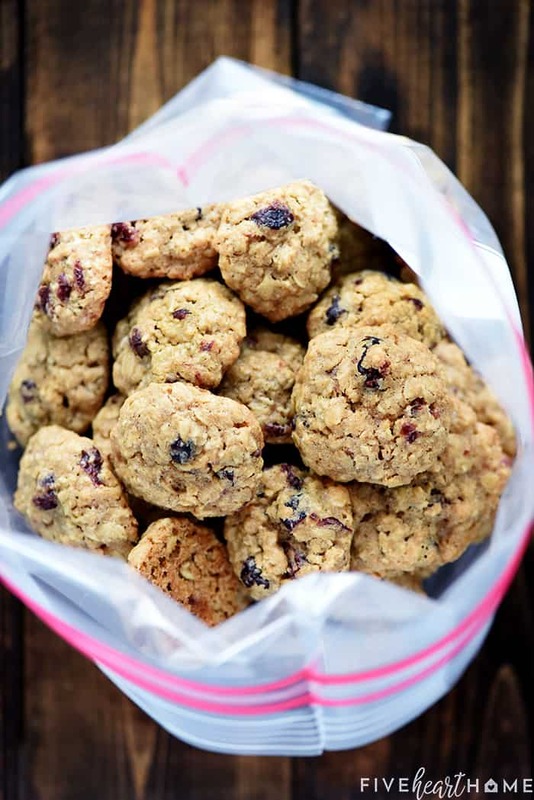 Anyway, back to these Oatmeal Lunchbox Cookies! They’re cute and they’re mini. They’re thick and they’re chewy. 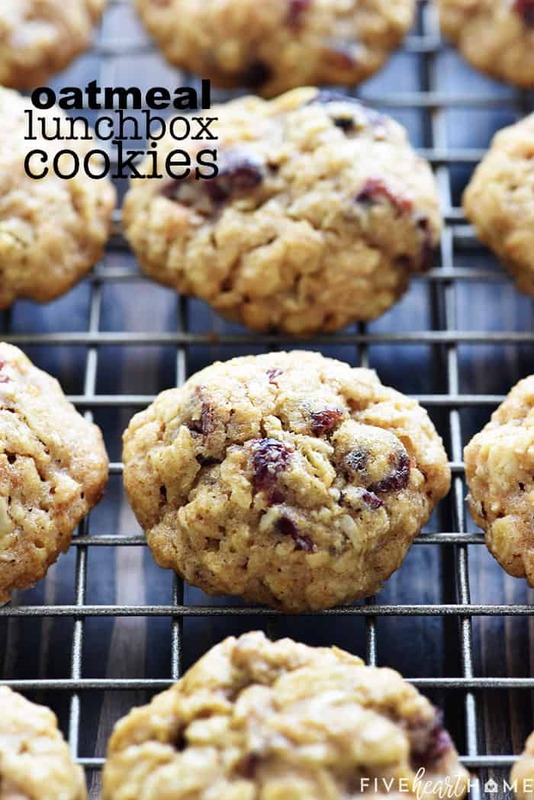 They’re studded with dried cranberries. And they’re quite yummy despite being not-overly-sweet. And since these cookies are intended to be the perfect size to slip into a lunchbox, each one only requires a single tablespoon of dough! That means that this normal-sized batch of cookie dough makes a ton of little cookies. Almost 7 dozen, to be exact. However, that mass quantity is all part of the grand design of this recipe. Because if one cookie-baking session results in 82 cookies to be divided between three kids at the rate of one cookie per lunchbox per day, how many weeks of school lunches will go by before I have to make another batch? The answer is a lot. I’m not actually going to waste all of my coffee-fueled brain power this morning figuring out how write and solve the corresponding equation to that word problem. Because I’ve already spent way too much time this week struggling to remember skills and knowledge from 30-ish years ago in order to check my son’s 6th grade math homework each evening. Middle school math is no joke, y’all. And Friday (today) means MAMA IS OFF HOMEWORK DUTY! All kidding aside, I don’t know about you, but when I make cookies, they never last long. So in order for these lunchbox cookies to survive long enough to, you know, actually put them in a lunchbox (thereby fulfilling their corresponding math problem), I had to get a little creative. In this case, “getting creative” meant popping all of the cooled cookies into a freezer-thickness storage bag and sticking the bag in the freezer. 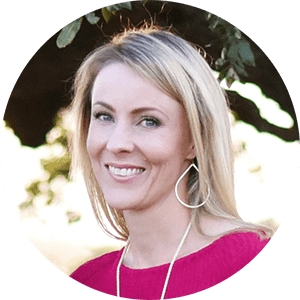 That’s right…freeze the cookies and they won’t be as likely to “mysteriously disappear” before they have a chance to arrive at their intended school lunch destination! 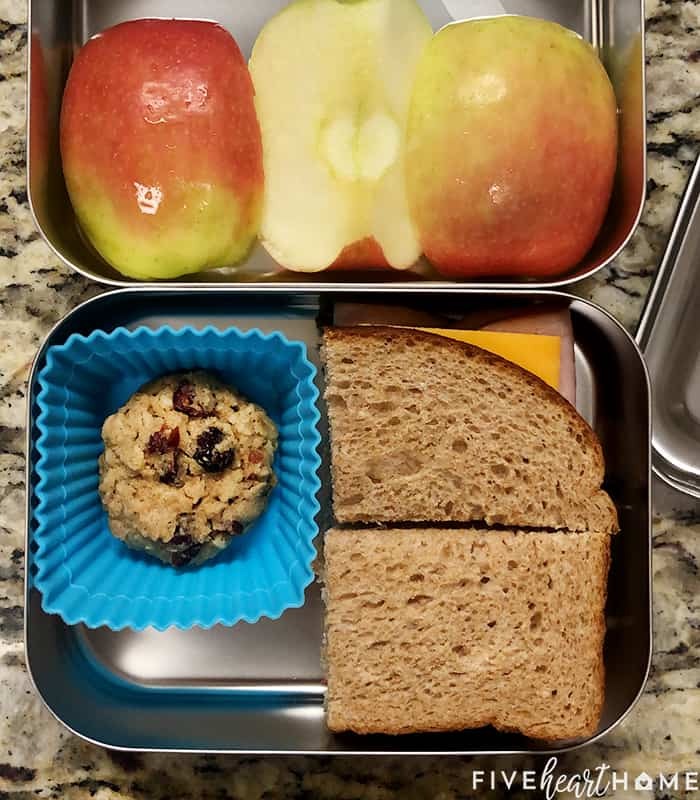 Then in the morning, when you’re packing your beloved offspring’s lunch, just tuck a frozen cookie into said lunchbox along with everything else. It will be thawed by lunchtime! And if it turns out that it’s not, I’m willing to bet it’ll still get eaten. 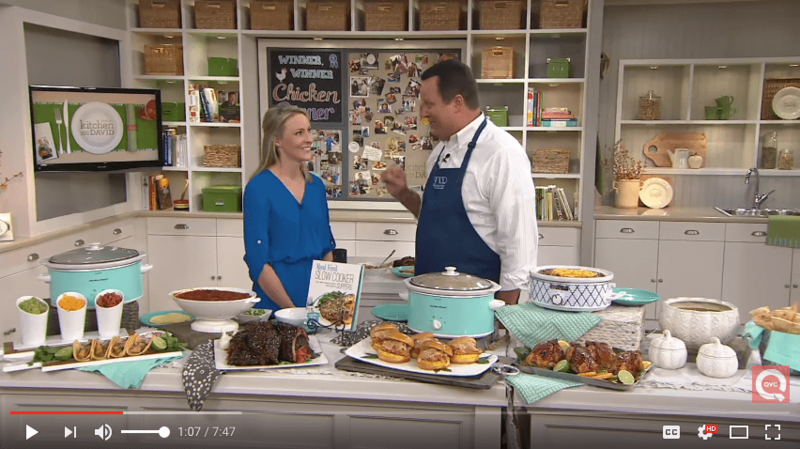 This is the sheet pan pictured in this post, on which I bake all of my cookies. I was able to fit 24 of these small cookies per pan. Whole wheat pastry flour is the key to 100% whole wheat cookies that aren’t heavy and dense, since it has a lighter taste and texture than regular whole wheat flour. 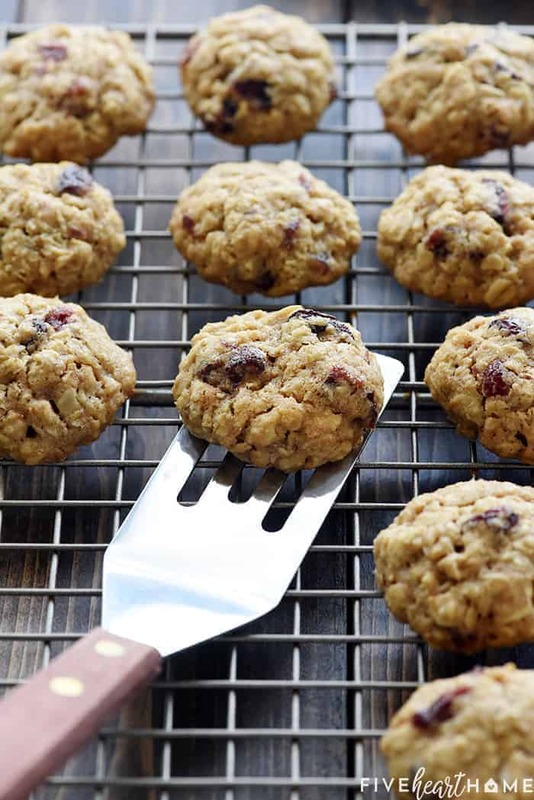 I do recommend making these cookies with old-fashioned rolled oats (as opposed to quick oats) because that’s what gives them their chewy texture. 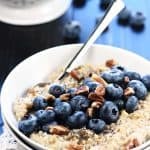 If you decide to use quick oats, however, perhaps start out by adding slightly less than the recipe calls for. Then check if your cookie dough seems too dry before adding the full amount. I used a 1-tablespoon cookie scoop, packed full of dough and scraped off across the top, for perfectly-sized cookies. If you make your cookies larger or smaller, you’ll need to adjust the baking time accordingly. I often make this cookie dough ahead of time, cover the bowl, and pop it in the fridge until I’m ready to bake my cookies. If the dough is too hard to scoop straight out of the fridge, I let it come to room temperature while the oven is preheating. You don’t actually have to make these cookies with the sole intention of popping them in lunchboxes. You also don’t have to store them in the freezer. Be a rebel if that’s your MO. Eat them straight off the pan! Or right out of the cookie jar! Never even allow them to get anywhere near a lunchbox! Because nobody can stop you from going all wild and crazy with your own personal batch of Oatmeal (Non-Lunchbox?) Cookies. 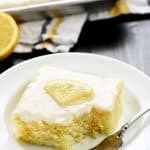 Along the same lines, if you’re truly a rebel, you can tweak this recipe to your liking to make it less healthy-ish. Use white all-purpose flour (instead of whole wheat pastry flour) if that’s what you’ve got on hand. Increase the sugar (to a total of 2 cups >>> 1 cup white granulated sugar + 1 cup brown sugar) if you prefer your cookies sweeter. 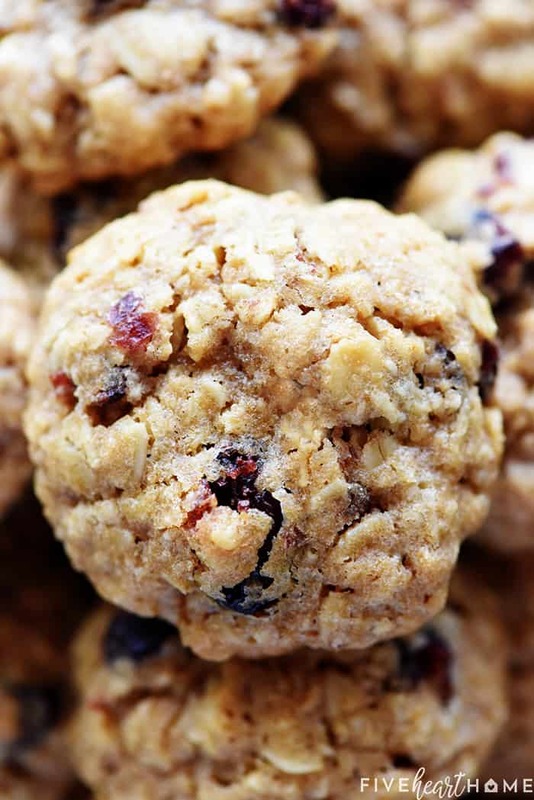 You may also swap out the dried cranberries for other goodies. 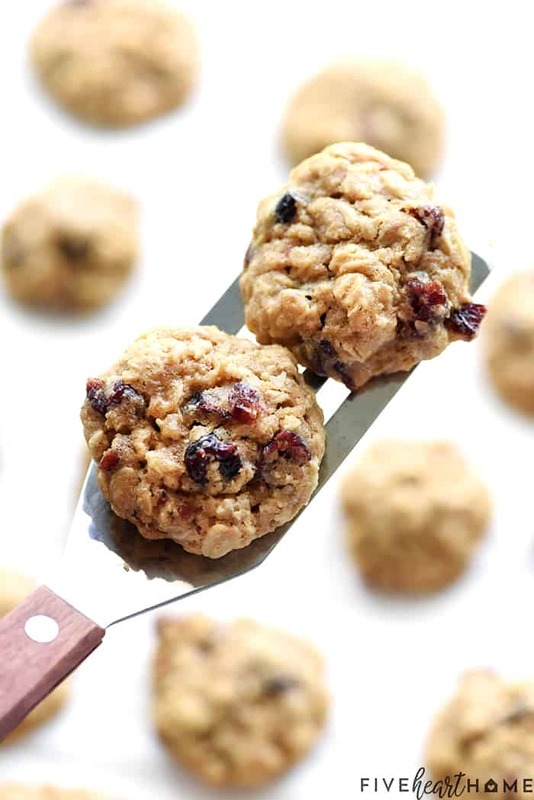 Raisins or mini chocolate chips are equally yummy in this recipe! 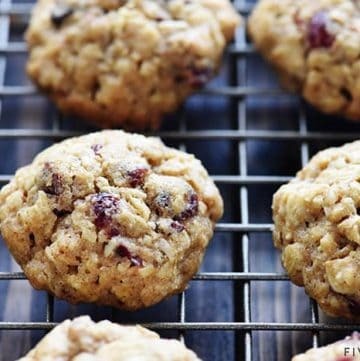 I enjoy these cookies without cinnamon so that their “oaty-ness” can shine through. But feel free to add cinnamon (about 1 teaspoon) if you like. 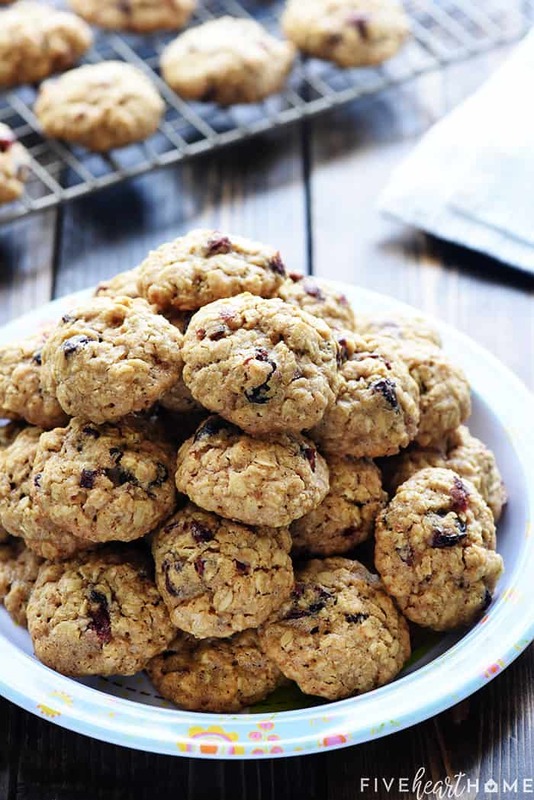 Oatmeal Lunchbox Cookies are small, wholesome treats perfect for tucking into a lunchbox to brighten your favorite child's day! Adjust oven rack to center position and preheat oven to 350°F. Line baking sheets with parchment paper and set aside. In a medium bowl, whisk together the whole wheat pastry flour, baking powder, salt, and nutmeg; set aside. 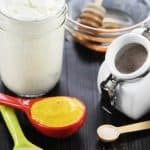 In a large bowl, use an electric mixer to cream the butter until smooth. Add the sugars and beat on medium high for 2 to 3 minutes or until fluffy. Blend in the eggs, one at a time. 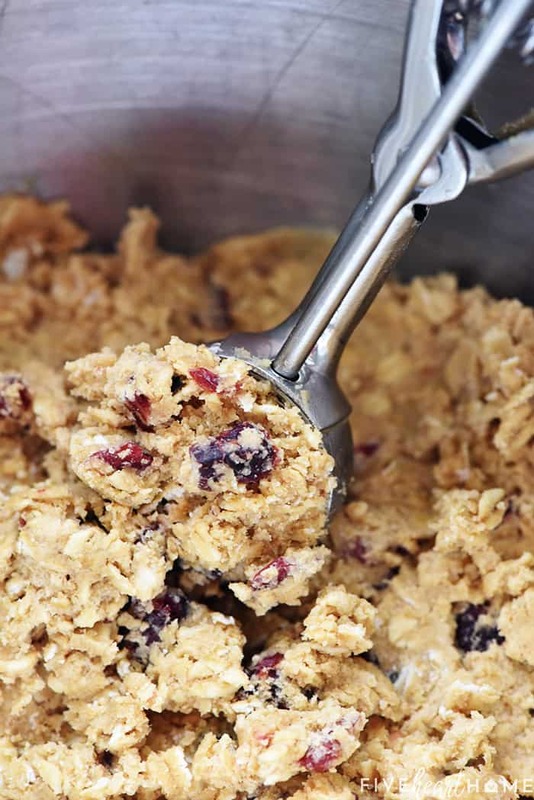 With the mixer on low, gradually stir in the flour mixture, and then the oats and cranberries, until just combined, scraping the bowl as necessary to ensure that all ingredients are incorporated. 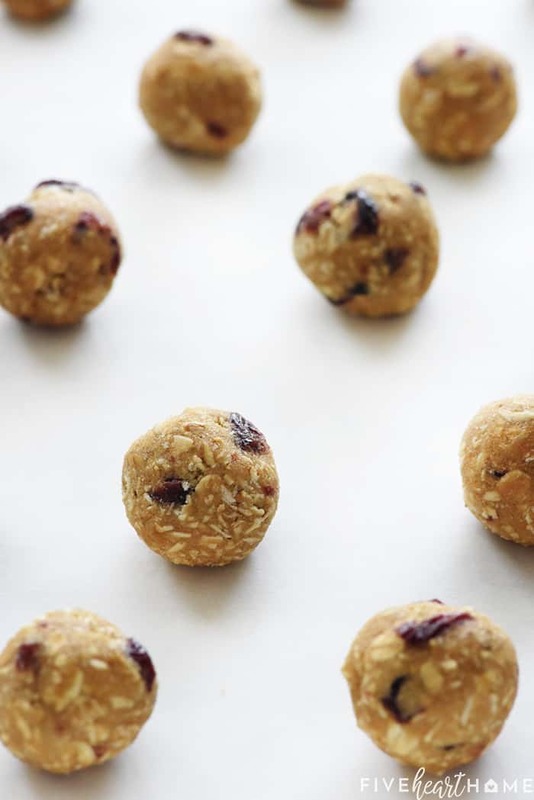 Scoop cookie dough using a tablespoon (or a 1-tablespoon-sized cookie scoop) and roll into balls (with an approximately 1-inch diameter). Space the balls at least 1 inch apart on prepared baking sheets. Bake for 14 to 16 minutes or until the cookies are set in the center and the edges are just starting to turn golden brown, taking care not to overbake. 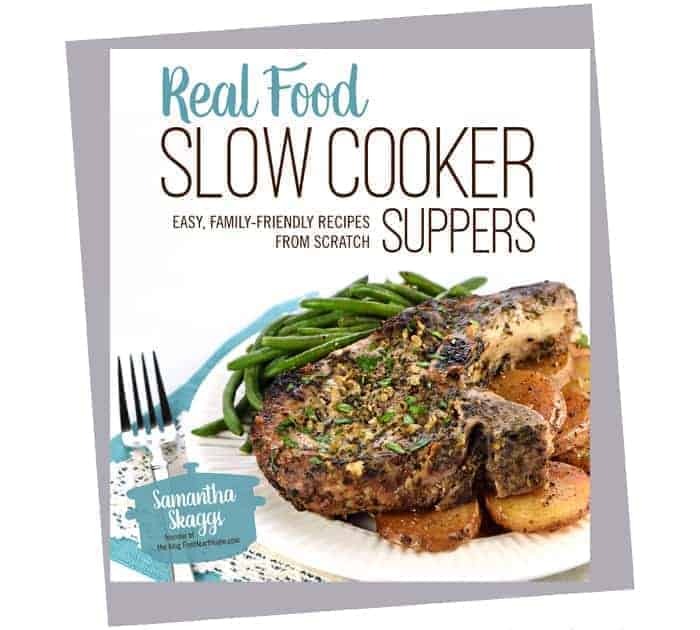 Allow to cool for 2 minutes on the pan before removing to a wire rack to finish cooling. Once completely cool, store in an airtight container. Wow! These photos don’t lie! 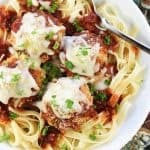 These look so amazing and delicious.